KIWI™ 3 continues to bring user experience to a new level through efficient, decisive management of your population PK modeling projects and co-worker collaboration. Share your share suite of customized diagnostic plots with your co-worker or use them on your next project. 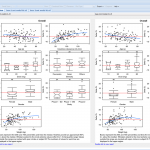 Visualize diagnostic plots and parameters for all candidate models in one view. Often there are multiple candidate models to review in order to select the one final model or the model that will direct you in a different path of model building. Evaluating the diagnostic plots and parameter and variance estimates is critical in decision making, but it is often confusing opening different graphs at one time by cutting and pasting into a word document or powerpoint presentation. Fully customized formatting and labeling within KIWI. KIWI 3 has customized format and label collections that can be used throughout a project or across different projects. This provides the modeler more control over the appearance of their graphs and tables. And these high quality graphs can be downloaded individually or as a group for direct import into a presentation or regulatory document. All formatted, all validated. Significantly reduces your time spent in preparing presentations and regulatory documents. Profiles, unique to KIWI, is a user interface to generate customized diagnostic, VPC, or bootstrap graphs with the ability to stratify by covariate, dose groups, etc.. A modeler can create as many profiles as desired. The Profiles can now be easily shared across projects for a single user or shared with co-workers, saving considerable time. What are providing with KIWI™? 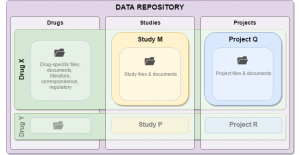 KIWI is a cloud-based web application that was developed to efficiently organize, process, maintain, and communicate the volume of data and results generated by pharmacologists and scientists over the duration of a drug development program. The validated workflow and tools within KIWI promote traceability and reproducibility of results. Leveraging our 20+ years of experience in providing an architecture supporting population PK/PD modeling and simulation efforts, we have developed KIWI as a secure, validated, enterprise-scale environment, enabling global teams to collaborate on model-based decision making. Speed and agility is more important than ever as the demand for M&S increases. KIWI allows you to easily select and compare parameters estimates and diagnostic plots across multiple candidate models in one view to make decisions quickly and confidently, and delivers high quality graphs to inform team decision making and put in regulatory documents – all formatted, all validated! 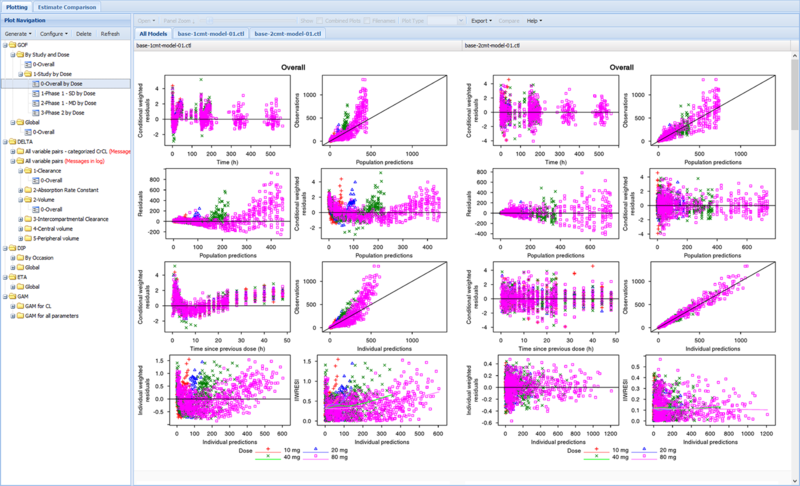 In KIWI, all the plots appear side by side in one view, and with a click of a button the parameter and variance estimates for the same models appear. The models can be easily switched up on the fly. Your teams will love being able to more easily distinguish between models by reviewing graphs and parameter estimates simultaneously and having engaging discussions where decisions are made! What's new in KIWI™ 3? Two new powerful visualization modules, ExploreLive and Explore, are introduced for exploratory data analysis (EDA) of information stored in analysis datasets and NONMEM outputs. 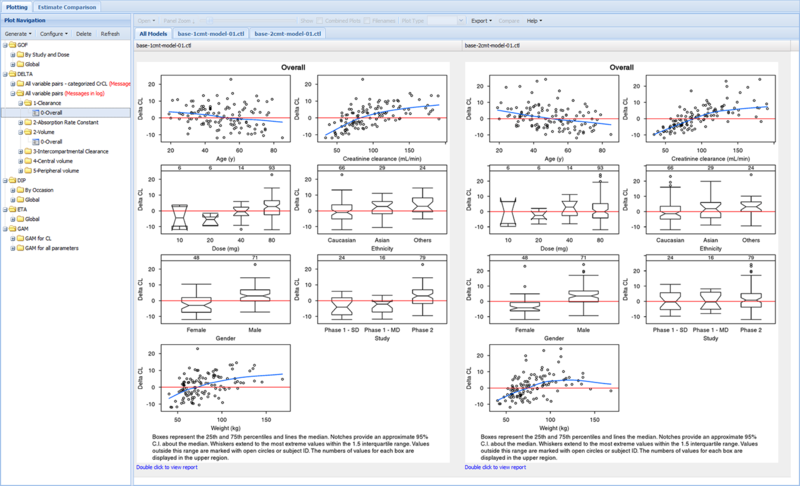 ExploreLive is an interactive R Shiny application that offers a sandbox environment for ad-hoc manipulation of data, creation of plots and summary statistics tables, and execution of small scale data analyses including data binning, linear regressions, and creation of Kaplan-Meier curves. 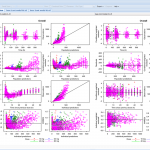 Explore is intended for creation and permanent storage of report-quality scatterplots, boxplots, bar charts, histograms, pairwise plot matrices, and summary statistics tables. It shares many elements of design and functionality with the Visualize module for model diagnostics, including the concept of reusable setting profiles, libraries of variable labels and units, data formatting, and the ability to compare EDA displays side-by-side across different data files. New automated diagnostics are now performed for every NONMEM run. They are visually reported in the Summarize module and inform users about potential issues in 11 key aspects of model optimization. KIWI 3.0 benefits from upgraded infrastructure and security and is now accessible through a completely redesigned Knowledge Portal. Improved formatting in Summarize and Analyze Exported reports . New User Manual -The KIWI 3 User Manual has been converted to a wiki-like format, and search capability is greatly improved . Just what you would expect from a fully integrated population PK/PD model management and communication platform.